Skegness United earned a pont from their first home match of the league season, drawing 1-1 with Division Three champion North Thoresby. United were missing a number of players due to various issues, including Ryan O’Loughlin, Nathan Wetton, Rhys Mansell and Jamie Turner. Returning to the squad were Sam Sleight, Jack Ashwell, Ashley Read, Kieran Rayner-Mistery and Aran Gray. The match started with Jack Minor in goal for the injured Connor Carse. In the early stages it was the visitors who looked the more lively and produced a half chance when they fired just wide of the post. After 10 minutes it was the turn of United, coming close to taking the lead when a good flowing move down the right resulted in Keaton Grainger firing just wide of the upright. After the slow start by United they began to have more of the game, without causing any major problems to the visiting keeper Jason Stamford. The first half was dominated by both defences, and very few chances came to either side, although United had just the more possession. The second half started with United looking the more likely to open the scoring. Within a minute a 20 yard shot by Karl Minor flew just wide of the post. However, at the other end it was Thoresby who came the nearest to open the scoring. When United failed to clear their lines a shot came in from the visitors which hit the upright before being cleared. United made a double change within a five minute spell when Aran Gray replaced the unwell Jack Ashwell and Sam Sleight came in for Sam Green. On 70 minutes United took the lead when Alex Kendrick put in delightful cross and Conor Minor rose above the visitors defence and headed into the corner giving keeper Stamford no chance. A couple of minutes later Kendrick cut in from the left and shot just over the bar with his drive. On 80 minutes Rayner-Mistry replaced Ashley Read. With United looking to be heading for three points, Thoresby won a free kick on their right, which was disputed by United. The ball was played in for a visiting player to head home. This was the first time in the match that the United defence had failed to clear a ball into their box. Shortly afterwards the final whistle blew with both sides taking a point. UNITED: Minor, Lyall, Read (Rayner-Mistry), Minor, Simpson, Ashwell (Gray), Kendrick, Hodson, Grainger, Minor, Green (Sleight); Subs (not used): Smith, Shafiq. On Saturday United are away to Ludford Rovers (KO 2.30pm). 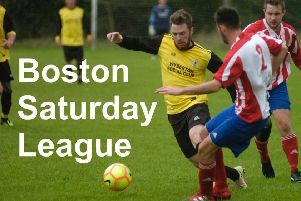 This will be followed by a home contest against Mablethorpe Reserves on October 1.